Sift flour and baking powder together; cut in shortening. Add soup; mix well. Divide dough in half; roll each half on a lightly floured board until about ½ inch thick. Sprinkle one half with cheese; place other half on top of cheese. Cut in squares or with a biscuit cutter. Bake in a hot oven (450°F) 15 minutes, or until brown. Makes 18 biscuits. Image: Published by Campbell's Soup Company. 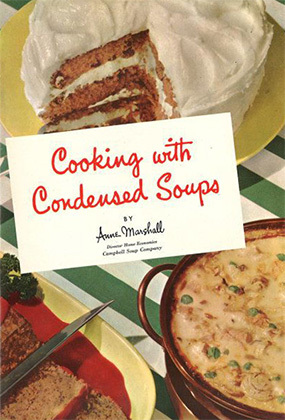 Cooking with Condensed Soups, 1950. Private collection.